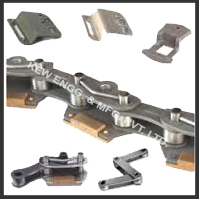 Manufacturer of high performance Chain Link Bottom Parts, Stenter Machine Spares and Chain Assembly. High quality Chain Link Bottom Part material with International Standards. Chain Link Bottom Part for all types of Stenter machines available. Pin Bar, Pin Plate, Stenter Clips, Gear, Shafts and many more. Heavy duty stenter machine and textile machinery parts in ready stock to dispatch on your desire requirements. We also Rubber Roller Manufacturer for the various textiles industries. High Strenth Material Used for strip & Pinbars.